Here’s a picture of my old Rival 32, Largo, in a lock somewhere on the North coast of Brittany, I should imagine. If you look very carefully, you will see the lovely gold line along the rubbing strake. I always thought it looked like solid gold – which it was… well not actually solid gold but it wasn’t gold paint. It was gold adhesive tape and it had the look of a chunk of gold that had been hammered into the hull all the way down. It looked particularly good against the dark blue of the strake. Samsara, being the same design, has a rubbing strake too but hers hasn’t been painted. I did think of it but, to be honest, it was a lot of trouble and if I want to paint it in years to come, there’s always the option. But I did want a gold line. I told Barry Lovell from TLC Marine all about it. I was still enthusing about the solid gold Sellotape when I realised he was shaking his head. There are many things – in fact most things – on which I would take Barry’s advice. But a gold line is not one of them. With all the passion of someone who is particularly attached to gold lines, I remained adamant and went and ordered a roll of the stuff from the chandlery. For the next few weeks that gold line was admired many times – not only by people who stopped to nod approvingly as they walked their dogs across the boatyard, but also on Facebook and on any occasion when people were too slow to run away before I found an opportunity to point it out. Then I made the terrible mistake of putting the boat in the water and going sailing – and, on the very first day, I looked admiringly at the creaming wake … and saw a flash of gold. There, twisting and turning like a very ostentatious mackerel line, was 30ft of gold tape trailing behind the boat. So we sailed all the way round the West Country and the South Coast looking just a little shabby. However, now that the thermometer has finally reached the 10oC required for painting, I’m pleased to say, the gold line is back. There is really no point in writing this blog if I’m not honest with you. In fact, if you look up the symptoms of ADD, you will find that compulsive honesty is one of them (even though it might not be the best policy sometimes). And there is something that I have to get off my chest. I’ve been keeping quiet about it for three months because I feel embarrassed and ashamed – but it would be worse if it were to come out and people thought I’d been hiding it. In November I did something really, really stupid. You may have been following my rather haphazard account of delivering Samsara from North Wales, via the South Coast to the River Deben in Suffolk. That’s where I live and although I don’t plan to keep her here (or come to that, anywhere in particular), the family did want to see the boat and I needed a destination (you do need a destination). All had gone very well (bar the incident in Brighton when a motor cruiser hit me and cracked the brand new teak rail, carrying away a stanchion in the process). For 24 hours nobody knew who had done it. I had been ashore at the time but eventually the berthing manager spotted the culprit on the CCTV recording and he was quite happy to take responsibility. He had sent his son to check for damage and the lad reported all was well. Anyway, the last leg was from Dover to Felixstowe – a wonderful trip because, if you time it right, you can carry the tide all the way for 12 hours. Better than that, on this occasion, I managed to get all the way there on one tack, only dropping the sails off the Landguard Buoy because by then it was pitch dark and the entrance buzzing with big ships pirouetting and pilot boats zipping between them at 24 knots. The plan was to drop anchor somewhere up the Orwell for the night and then go round to catch the tide into the Deben the next day. Once past the glare of Felixstowe docks, the night was as black as can be – no moon and just the winking red and green lights marking the fairway. I brought my new torch on deck – high-tech and expensive with heaven knows how many lumens. I shone it out onto the water, the beam picking up the buoys as we passed. Meanwhile the plotter, dimmed as far as it would go, showed us progressing safely up the starboard side of the channel. And this is where things went wrong. The phone rang. I remember the first time the phone rang on a boat. We were going up the Swinge off Alderney in the early 90’s. It was the weirdest sensation. But now people think nothing of the phone ringing in all sorts of place – and, of course, in cars. Now, in a car, you mustn’t touch the phone. But you can press a button on the steering wheel and have the call played through the speakers. Well, Samsara isn’t geared up for that, but I did take it out of my pocket and start talking – after all, it wasn’t as if I was doing 70 miles an hour on a motorway. From time to time, as I chatted, I checked the plotter, shone the torch ahead, kept an eye on the buoys. And it was during one of these checks that I was concerned to find I had wandered out of the channel to starboard. In fact, I was inshore of a line of moored boats. I slipped the phone into my pocket, shone the torch ahead, adjusted the course. Shone the torch again – no more moored boats – and resumed the call. Pretty straightforward, you might think. Nothing to worry about. I glanced at the plotter. In the glow of the steaming light, I could see a mast. I had hit a moored yacht almost head on. My bow was higher than hers and my anchor had smashed her pulpit and as, I continued down her port side, carried away two stanchions. I won’t go into what my friend heard over the phone in the next few moments but about ten minutes later, when I went to call him back to explain, I discovered he had been holding on the whole time. Anyway, I picked up a mooring nearby so I could inspect the damage in the morning. It was not as bad as it might have been if this had been a full T-bone collision. For my part, a weld on the pulpit had given way and there was some damage to the bow roller and anchor fixing. The anchor itself was unscathed. Over dinner and recriminations, I considered what to write on the note I would leave on the other boat. But in the end, I called the adjacent marina and established that this was one of their moorings. They would pass on my details to the owner. Meanwhile, I have been berating myself about How Could This Happen? First of all, there is no doubt – for me especially (see AADD above) – a mobile phone is a distraction. It’s not like talking to a crew in the cockpit. It takes you mind hundreds of miles away from where you are and even if you’re not doing 70 miles an hour on a motorway, that can have catastrophic consequences. And it was only last week that I made a discovery about that torch. It has three settings: Very bright, quite bright and not-at-all bright. I would have known this if I was the sort of person who reads instructions – but what instructions do you need to operate a torch? What I would have understood if I had read them is that the first time you switch it on, it is very bright. If you turn it off and on again, it will be quite bright. But if you are approaching a boat with a blue hull from head on and you switch on your torch when the sequence happens to have reached “Not Very Bright At All”, you might as well be without a torch at all. This is not an excuse. It might be called a “contributory factor”. But the fault is nobody else’s but mine. It was a salutary lesson and I promise you I shall learn from it. The main thing is that nobody got hurt and damage can be repaired. Besides, guess what I got for Christmas: A night vision monocular. We’ve all got the ideal boat. I found mine while going to a family wedding in Australia. The owner had done much of the fit-out himself – and all with loving care. You could see how much of his soul went into this – after all it was his big project … his retirement in the sun. The trouble was, by the time he finished it, he was too old. His health had taken a turn for the worse and she was up for sale for a fraction of what he’d spent on her. She was too much for me – both in terms of expense and the sheer weight of the gear. But she did provide a vital lesson: You’re never going to be completely ready. As long as the boat is properly seaworthy, it is more important to get on your way than to have somewhere dry to put the loo paper. And it had too. Nobody had noticed – even the surveyor hadn’t noticed. Of course, once a hull has been pointed, it has to go on being painted. I spent a depressing 24 hours looking up the cost of a respray and then went out and bought a paintbrush. I must say, I’m very pleased with the result: If you don’t get too close, you’d never know the difference. But of course, that meant the four coats needed a week to harden before she could go in the slings. So when we reached the third attempt and Dave Worthington, the engineer, came down to oversee his skin fittings getting wet for the first time, we started the engine. The engine was one of the many items excluded from the survey. It took several attempts at starting. Dave bled the fuel. He listened, head cocked on one side, clearly not happy. Although it ran, it didn’t seem to pick up properly – as if the cylinders were having trouble working out who was going to go first, like a rugby club making for the saloon bar. And that was how I found myself half-way through the tortuous passage over Conwy Bar with no engine and no wind. Fortunately, there was no tide either. I called up the Marina. Did they have a workboat handy to come and rescue me? Conwy Marina did not offer any service outside the confines of their property (insurance). I was advised to call the coastguard on Channel 67. And the next morning Dave returned and discovered that the electric “off” switch was sticking. I could have spent a day bleeding the system without discovering that. It’s more than three months since I first saw Samsara. I went up North Wales on the train and, after checking into the cheapest B&B (the whole place smelled of stale milk) I walked down to the marina for a preview. Actually, in this instance, it might not have been such a bad idea. The first impression was that this had been a wasted journey: While it is one thing for an old boat to show her age – you don’t want an antique to look as though it just came out factory – it is quite another when the words “shabby”, “a sorry state” and “sadly neglected” come to mind. Wherever you looked there were scuffs and chips and poorly-filled holes. The scuppers were clogged with leaves and filth and there were things growing in the cockpit grating. One glance at the stem showed that the ancient 35lbs CQR had been taking bites out of it for years – to the point where the owner seemed to have given up worrying about it. But I was looking for a boat to be my pride and joy – a joy for years to come. But I was not looking for “project”. All the same it was a long way to come and not see the whole boat – so the next morning found me returning at the appointed time to find the owner had clearly been there for some while attempting to put an encouraging gloss on things. He needn’t have bothered because, as I mentioned in the last post, it was at this point that the boat took over. Little by little – without a lot of fuss or ostentation – she revealed herself to be just what I had been looking for all my life. In fact, I did better than that. I found a wonderful man called Barry Lovell and his little company TLC Boat Repair. 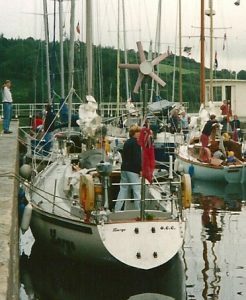 It was the fact that the celebrated yachting writer Tom Cunliffe had trusted him with his Constance that decided me. After all Tom is a noted perfectionist. For there was I, a stranger in town – 300 miles from home – knowing no-one and about to take a leap of faith with my pride and joy – and Barry put me on to all the right people. There was Richie Williams in a workshop which looked as thought it was waiting to be condemned who took the Aries self-steering piece by piece, understood instinctively how it worked – even though he had never seen one before – and put it back together again like a sewing machine. There was Dave Worthington who worried away at the prop shaft so that I could have a feathering propeller which is as exciting as other men getting a Ferrari. There was Mike Kelly the stainless steel specialist who worked up until midnight because I forgot to tell him I wasn’t going in the water the next day after all. Dave Evans with his brilliant idea for the new gas locker… Dave Jones who calmly accepted my electronic foibles like getting a regulator from Singapore instead of Milton Keynes. Over three and a half months they came and they worked and they humoured me and if the launch date was put off and put off again until here we are going in the water in September, none of this matters if we get it right in the end. And we have. 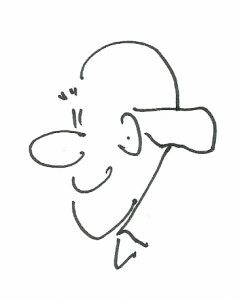 In fact I have decided to add an extra page to the blog – a page of links to the people who have made it all possible. Harry Potter’s wand chose Harry Potter. Everyone knows this. So, is it beyond the reach of imagination to suppose that the boat chooses the skipper? Because to some of us, boats are not like cars or washing machines. Boats are not things. If you don’t believe that a boat enters enter into a partnership with her skipper – particularly the singlehanded skipper – then you have not sailed a long distance singlehanded. Read Joshua Slocum. 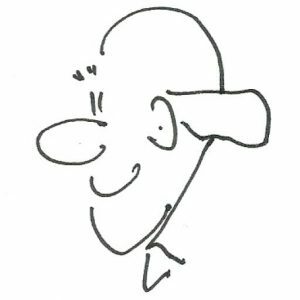 Read Bernard Moitessier. Read Ellen MacArthur… These sailors understood that it wasn’t just them sailing the boat. The boat itself had an input. Indeed, when the skipper was exhausted and unable to make sensible decisions then it would be the boat that would take over and ensure that they both survived. Of course, this is not something you would want to rely on – like the Winnibago owner of legend who set the cruise control and went to make a sandwich (and then sued the manufacturers when the thing drove off the road). In fact I would suggest it is possible that peculiar instances of a boat appearing to take over might occur two or three times before the more logical type of sailor can bring themselves to talk about it. But in the annals of singlehanding, there are just too many accounts of unexplained good fortune for it to be a coincidence. There I was sailing across the Grand Banks in not the best of visibility. It was 1988, so radar was a luxury but I did have a gadget which was supposed to detect radar signals from other vessels. It was very expensive and the box made it sound tremendously clever – but I had never known it to work. Meanwhile the Aries windvane steering was in command and I was asleep with the alarm set for 20 minutes. This had been going on for 12 hours or more and I was heartily sick of the incessant hopping up and down. There was never anything there – all day long, just an opaque grey curtain about a mile away. Now, in pitch darkness, it was like being in another dimension – no stars, nothing to distinguish the sea from the sky. Just a faint glow of phosphorescence in the wake and only the rustle under the bow to show that we were slipping along nicely at three knots. And now the alarm. The kitchen timer was on the other side of the cabin. It wasn’t going to stop until I got up. Of course, being so well used to this incessant beeping, I experienced a certain satisfaction in lying there and putting up with it. It can also be the wake of a passing ship. Suddenly, framed in the companionway – filling it with a blaze of light – was a Grand Banks trawler, the stern filled with men in filthy oilskins staring out into the darkness. And then, as they watched, the boat swung back onto her course. I looked at the compass. Good Lord, we had been off course. That was why we passed across the fisherman’s stern, not his bow. In fact, we must have been off course by as much as 30 degrees just when it made the difference between being rammed and being an object of curiosity for the crew during a long night gutting cod. And how was that possible? On a calm night with a steady breeze, for the windvane suddenly to bear away by that much – and, more to the point, resume the course once the danger was past? On a scale of weirdness, this was right up there with abominable snowmen and Morris Dancing. I reckon I know because the same sort of thing happened once in the Chenal du Four when the fog came down in the middle of tricky bit – and on the way to the Azores when it would have been just as easy to sail into the enormous, rusty structure floating just beneath the surface instead of so close past it that I could see the little crabs scuttling about on the long fronds of seaweed. I know what the cynics will say – that there are just as many examples of singlehanded sailors who perish with their boats. The cynic might argue that all of this is just the Law of Averages mixed up with an unhealthy dose of Wishful Thinking. But I believe it happens. And I believe it’s happening again. If you buy an old boat, the chances are you are going to buy an old anchor. And she comes with an antique anchor: A venerable 35 lbs CQR which has served her well through all her adventures on both sides of the Atlantic. After all, in 1973, the CQR was the anchor of choice for the cruising yachtsman – actually, there wasn’t much choice. That and a Danforth kedge seemed to see most people through most situations. But times have moved on. We now have the New Generation Anchors – and in any comparison test you care to look at, the dear old CQR comes out very poorly. The main problem is that you have to drag it around the anchorage before it will set – which may have been fine when anchorages were less crowded but try that in the Newtown River on a Saturday night and you’ll be very unpopular. These days there are anchor manufacturers who claim their product will set in less that a metre. Besides, the hinge on the old CQR had experienced 35 years of wear and – while there was still plenty of “drop-forged steel” to hold it together – I suspect that the geometry has gone to pot, making setting even more of a problem. So I did my research and I’ve gone for a New Zealand-designed Rocna. The next choice was the size. According to the company’s chart, the 15kg would be ample – that’s 33lb. The trouble was, my eye kept sliding across to the next column, the 20kg (44lb). For a 32ft boat, that would be considered a storm anchor. It is argued that boats heading for extended cruising should carry a storm anchor. It is also argued that by the time you realise you should have set the storm anchor, it will not be a very good moment to try and do so. You will sleep a lot better if you know it’s down there already. So it was back onto Google for more research. This was when I stumbled on advice from the Rocna people saying they discourage going up a size. They had already factored in everything the prudent yachtsman would need for peace of mind. So I called up Pirates Cave to order the 15kg. In end it doesn’t look out of place on the bow – and best of all, it might have been made for its passsage-making stowage in the fo’c’sle. 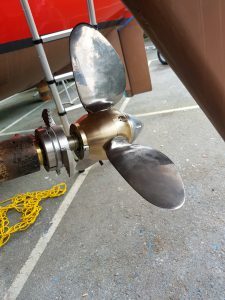 Well that’s settled then: The new propeller is going under water. I wanted to keep it on the saloon table as a conversation piece but Paul the engineer started talking about stepped key material and I lost my enthusiasm for argument. However, you must agree that the new prop is a thing of beauty: A hand-crafted (individually made to order) Featherstream from Darglow, it looks like something you buy at a private viewing in one of those little galleries between Soho and Mayfair – and then take it home to be the centrepiece for the dining table so people can exclaim! However, as I say, I lost the argument – and reasonably so: After all, I’m told it will give me an extra 10% of speed. That means a ten-day trip to the Azores suddenly becomes nine days. Of course, I could get the same effect by buying a new genoa. But how much would that cost? And how long would it last? So spending more than £1,000 on a propeller doesn’t seem quite so mad after all. People spend a lot more buying a Monet. The final payment had just about cleared. 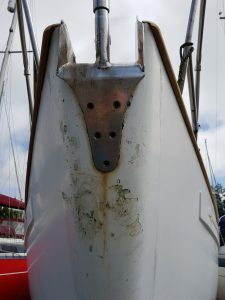 There was not a mark on the gelcoat and the first barnacle had yet to think about testing the antifouling. With a certain ceremony, the new owner removed the colour-coordinated cover from the wheel, spun it experimentally – and then swore as it bounced back and attempted to snap off his thumb. He tried it the other way. He tried it both ways. He peered over the stern into the murky waters of the tide-locked marina. Something was preventing the wheel from turning. Now you don’t want to cause a fuss at this point – not as a new owner who hasn’t even made a start on the pile of instruction manuals. But this was a brand new boat – just out of the box as it were – the wheel should turn… shouldn’t it? The wheel clamp was off, self-steering disengaged. So what was stopping it? 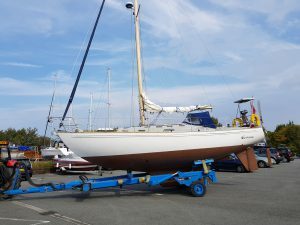 He did find the head of the rudder stock, neatly hidden beneath a flush-fitting circular cap and he found the emergency tiller under the navigator’s seat – just no access to the steering gear itself. I was told this story by the shipwright who came to remove my stanchions. You never think you’ll have to remove stanchions, do you? But after 44 years, the wire begins to wear away at the holes, the surveyor takes note and the insurance company insists – even though the wear is on the inside. But would you believe we took eight of them out – 24 nuts which hadn’t moved in almost half a century. Oh, we did collect a very nice little pot of screws as headlinings came down, tiny hatches opened in places nobody had ever thought about. In short, we had access. In fact, he thought of almost everything. What he failed to consider was the possibility that one day his boat would fall into the hands of someone who didn’t want yacht legs. Yacht Legs are a wonderful invention if you really want to sit on the sand but how often will I want to do that? And think of the room they take up and the astonishing amount they weigh? So I set to removing the ugly corroded fittings on the rubbing strake. Down came the headlining again, out came the fridge and the fitted lockers. In the end, it was the safe that stumped me (yes, the boat has a safe). Quite sensibly it was not installed with a view to being removed. So yes, we now have two small access hatches high up on each side of the saloon. At least they’re on the inside.